Summer Brekky’s Christmas Movie Film Fight! As usual, during this time of year, the conversation came up ‘what’s your favourite Christmas movie?’. Now, the 98five team are a vocal bunch and we all love to share our opinions. So this casual conversation became a bit of a debate. The Summer Brekky boys, Tama and Corey, have taken it upon themselves to determine, once and for all: What is the ultimate Christmas Movie? They’ve taken a round-robin approach, they’ve listed 12 of the most famous Christmas movies and they need your help to get the final result. So when the boys start talking about your favourite movie, make sure you text in and vote for it! Miracle on 34th Street went up against Planes, Trains & Automobiles with Miracle on 34th Street winning. And Die Hard versed Home Alone with Die Hard taking the win. 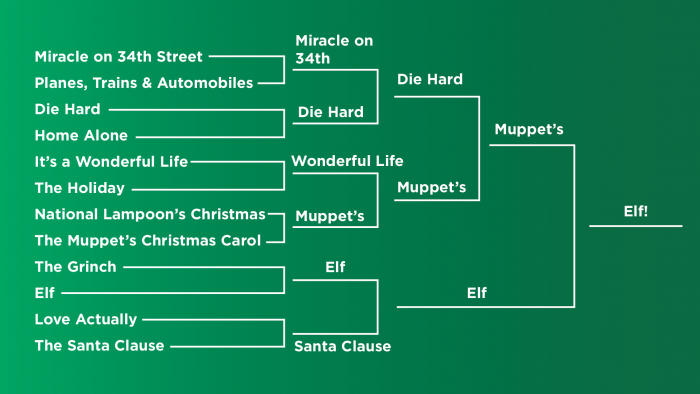 It’s a Wonderful Life won against The Holiday and The Muppet’s Christmas Carol won against National Lampoon’s Christmas! Elf won against The Grinch and The Santa Clause won against Love Actually. Thank you family for helping us determine, officially, the best Chiristmas movie ever!